Please sign this petition as we try to free Pastor Saeed from months of abuse and isolation in an Iranian prison. The Iranian government is listening now, and signing this may be more important than ever. True love doesn’t throw in the towel because things don’t seem to be working. Scripture says love “always perseveres” (from 1 Cor 13:7). Please sign this new petition for Pastor Saeed. It might seem signing petitions isn’t working, but it’s a gift we can give him. We can’t bring meals to his cell or doctors to tend to his wounds. But we can sign our name on a letter that says we care. And most of all, we can pray. Have you ever seen a picture of Daniel and the lion’s den in a children’s book? Sometimes, the lions look more like plushies you could buy at F.A.O. Schwartz than the vicious, ill-tended-to, underfed, and totally feral creatures they probably were. These lions were no one’s pets. They had a dual purpose: to show off the kings’ power and to eat the flesh of anyone who crossed him the wrong way. They represented the capricious nature and absolute authority of the king. One day you could be a guest of honor at his table; the next, the dinner of his beasts. More than any god or other mythological power, the king was to be feared. The people of Daniel’s day had one primary fear: the wrath of the king of the greatest empire in the world. It was a fear no one would have called irrational or over-exaggerated or misconstrued. It was a fear no one questioned. It was simply how you lived your life: under the thumb of a king wealthy beyond imagination, supreme in authority, and gorged on power. It was exactly the way the unseen ruler of this world, Satan, prince of demons, intended it to be ran: Everyone worship the Babylonian and then the Persian superpower . . and in the growing fear of the king’s wrath . . in the awesome terror of enraging the king . . lose all capability of love for God. Daniel was extraordinary because he feared the invisible God more than he feared the visible and ferocious superpower of Babylon and Persia. How many Daniels do you know? Who do you know who would rather go to a lion’s den for God than a palace for Satan? Who do you know who would descend into a lion’s den before he would ascend the gilded temple steps of Satan’s throne? 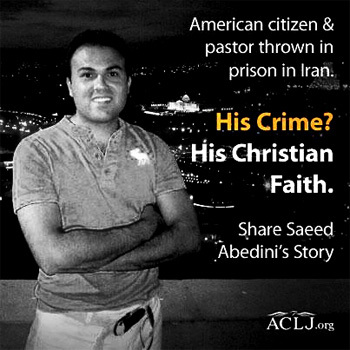 His name is Pastor Saeed Abedini. Geographically, Pastor Saeed is imprisoned in what would have been Persia in Daniel’s day. Daniel chose to be lowered into a black pit with ravenous beasts rather than deny God. Saeed has chosen to be forced into a black pit with murderers rather than deny God. Daniel was willing to face hungry lions before he would give up his love for God. Saeed was willing to face separation from his family, imprisonment, violence, and death before he would give up his love for God. Daniel was willing to give up his position as a respected Persian governor. Saeed was willing to give up his position as a respected American citizen. Daniel loved God more than he feared lions. Saeed loves God more than he fears murderers. Pastor Saeed is our modern day Daniel. Daniel was forced to go into exile in Babylon, and he later ended up in Persia where he would face the king’s lions. But Pastor Saeed chose to leave the safety of America and take a plane to a country he knew to be one of the most dangerous in the world. And he did it for love. I think Daniel will very much want to meet Pastor Saeed one day. They will have a lot to talk about. As God shut the mouths of the lions in Daniel’s day, let us pray that God shuts the violence of Rajai Shahr prison down. As You closed the mouths of the lions, God, close the violence of Rajai Shahr down. This blog is dedicated to Pastor Saeed. Sign the petition here: http://beheardproject.com/saeed#sign. Could you spare 1 minute and 45 seconds to learn how you could help save the lives of many men? What about to save just one? 60 seconds could be the difference between life and death. Pastor Saeed has been in prison for 410 days after helping to build orphanages in his native country of Iran. He has been beaten, refused medical care, and received death threats. NOW HE IS IN MORE DANGER THAN EVER BEFORE. On Sunday, November 3, he was moved to a prison for murderers and others who have committed violent crimes. THIS MATTERS. By God’s grace through the prayers, petitions, and the voices of ordinary people, in 2012 Pastor Youcef was FREED from an Iranian prison, even though he had been sentenced to DEATH. If you spent the 60 seconds reading this and signing the petition, THANK YOU! May Christ bless you for this! The prison where Pastor Saeed has been taken is called Rajai Shahr. More than 4 times as many prisoners are crammed into this prison as the maximum capacity, and it’s been reported that Pastor Saeed is sharing a cell with 5 other prisoners. He’s been described as “a modern day Daniel in a lion’s den”. Pastor Saeed has already witnessed 2 murders since he was moved to this prison on Sunday. The prisoners attack each other, and the guards come into their cells to beat them. The guards can also execute prisoners when they wish. God truly needs to close the violence down around Pastor Saeed as He closed the mouths of the lions in Daniel’s day, if Pastor Saeed is going to live through this. And believe it or not, Persia, where Daniel spent his time in the lion’s den, shares territory with modern day IRAN. Whether God chooses to free Pastor Saeed in this life, or to wait until Heaven for the reveal of this believer’s freedom, we must lift him up in prayer daily. It’s been reported that he has brought 30 people to Christ since his time in Evin prison. –Please resend this message, or a personal message of your own, to friends and family who might sign this petition. Let’s show Pastor Saeed and the world that we remember him–no matter what. And please pray for the 5 men Pastor Saeed is in a cell with, that they would all come to Christ. I cannot forget this pastor. Sign the petition. But don’t stop there. When we don’t forgive, we drink the poison ourselves and then wait for the other person to die. And we take the knife that has hurt us and we stab ourselves with it again! And this is the will of the evil one who wants to destroy us. Tags: forgiveness, forgiveness even in prison, letter from prison, Pastor Saeed, Pastor Saeed Abedini, poison of bitterness, refusing bitterness, the power of forgiveness through Jesus Christ, What is forgiveness?